Sunday May 4th 1902 Will come for me early and we hurried home in time to escape a rain. I have a lot of little chickens hatched. Will and I talked most of the afternoon. I did so enjoy my visit, it did me so much good. Monday May 5th 1902 Fred did churning for me in the morning. I took of more little chickens and in the afternoon Fred helped me clear out the old house and fix nests to set more hens. It rained more in the afternoon. Will fixed the planter and started it today. 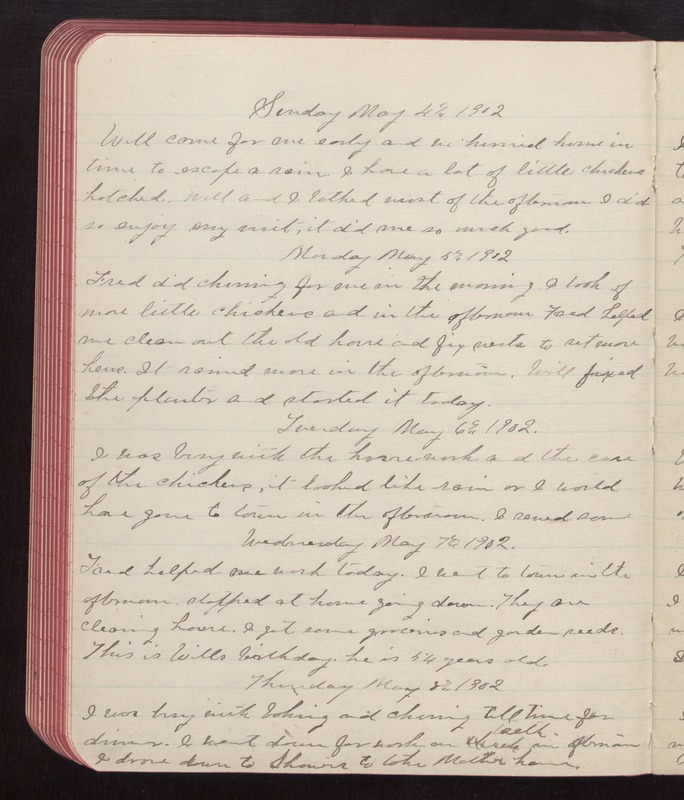 Tuesday May 6th 1902 I was busy with the house work and the care of the chickens. It looked like rain or I would have gone to town in the afternoon. I sewed some. Wednesday May 7th 1902 Fred helped me work today. I went to town in the afternoon. Stopped at home going down. They are cleaning house. I got some groceries and garden seeds. This is Wills birthday. he is 54 years old. Thursday May 8th 1902 I was busy with baking and churning till time for dinner. I went down for work on teeth in afternoon. I drove down to [Shavers?] to take Mother home.